Car got a flat? Need to get back on the road? What is worse than losing tire pressure when you find yourself on the side of the highway with miles to go until the next gas station? If you have ever found yourself in this situation, you know how difficult or frustrating it can be to get in touch with AAA to get you a new tire or spare. Ever try putting on your own donut only to see that your jack isn’t operating correctly? Not to worry—we’ve got you covered. With the Wikolia portable auto air compressor, all of these problems are gone with the push of a button. Thanks to its fast compressing technology, you will never have to worry about pumping up your tires on the side of the road again. When you need to inflate the tires of your car immediately, you must have a reliable, all-in-one solution. You need something that works fast and efficiently so that you can keep moving forward. The best solution is a reliable portable tire inflator compressor. These compressors come in all sorts of shapes, sizes, and models, which can make the process of selecting one a bit overwhelming. In this review, you will see that the Wikolia portable auto air compressor is one of the best products on the market today. Portable – One of the most important things to look for when purchasing such a product is portability. With the Wikolia, you will never have to worry about. With its compact design, you can carry and store the product anywhere. Digital Display – Modern inflators come with a digital display so that the user can read the pressure while ensuring that it remains consistent. With this feature, you can prevent future accidents from occurring. The display comes with a backlight if you ever, unfortunately, find yourself experiencing a flat at night. Ease of Use – The Wikolia portable compressor is simple and easy to use; you don’t have to be a tech wiz or a master mechanic to enjoy the benefits of the product. The Wikolia comes with simple instructions that anyone can understand. Durable – It is important to purchase a product that can handle extended use, and the Wikolia is reliable, even when used often. Inflation Issues – Some customers have complained that the product is not highly effective when working with large trucks, stating that the process took more than six to eight minutes and that tire psi actually went down. Case Fit – Some customers have complained that the product doesn’t store well within its portable case, which creates a hassle when taking out the product. Some are finding the case to be thicker than anticipated. Limited Warranty – We would like to see a warranty that lasts longer than three months for a product that is designed to deliver solutions in case of an emergency. All in all, reviews for the Wikolia portable unit were incredibly high, so you shouldn’t be too concerned about the mixed reviews. The Wikolia portable auto air compressor features a simple-to-use design to eliminate hassle. 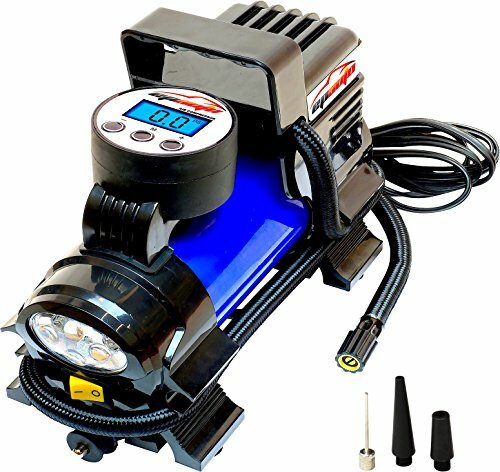 It is a 12-volt DC air compressor that provides 150 psi for inflating. You can use this item for cars, trucks, bicycles, and some other tires. The product comes with an auto shutoff feature for safety, and it can inflate a standard car tire within five minutes. It also comes with three different spray nozzles for a variety of applications. You will be amazed at how simple and effective this device is in solving your tire pressure problem. Simply attach the nozzle, and press a few buttons. You’ll have the confidence to attack the roads for extended trips knowing that you will always have a reliable back-up plan. The power of this product is strong. Q: Does the air hose clamp onto the value steam? A: Yes, the formatting is highly effective and convenient. Q: Does this compressor come with a wall outlet plug? A: No, it does not. You can purchase an AC to DC power socket adapter converter if needed. Q: Does this product come with attachments for basketballs and other sporting equipment? A: Yes! The product package comes with three different spray nozzle adapters for bikes, motorcycles, pools inflatables, balls, and mattresses. Q: How can it inflate a motorcycle that doesn’t have a cigarette socket? A: We recommend getting a 15 amp power converter that converts 110-120 volt AC to 12 volt DC. Q: Is the product rechargeable? A: No, the product needs to be connected to a cigarette socket. A: Yes, it comes with a 90-day worry-free return policy. 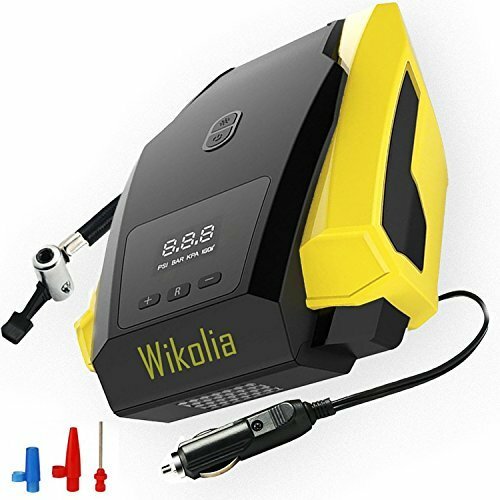 The Wikolia portable auto air compressor tire inflator pump is the perfect all-in-one portable tire compressing solution. If you are tired of finding yourself with flat tires on the side of the road, waiting for AAA or installing your own donuts, then invest in this product. The Wikolia delivers solutions for not only your tire pressure but also your recreation devices. Learn to use the Wikolia to handle all of your air compression needs. Skip the trip to the gas station, and rely on this awesome device. Once you purchase this product you will never have to worry about your air compression needs again. With the Kensun, you will never have to worry about inflating your tires again. This compact air compress comes with everything you need to quickly fill up your tires so that you can get back on the road. Kensun is one of the most trusted names in automotive accessories, and you’ll feel safe knowing one is tucked away in your trunk! What if you didn’t have to deal with lengthy lines at the gas station or long waits for roadside assistance? What if you had an instant solution every time you had a flat tire? Are you tired of having to pull out that rusty old donut in the rain when you just want to be able to keep moving forward? Say goodbye to all of the BS involved with a flat tire and get yourself an instant compact solution. Adaptable Sockets – The Kensun transcends the function of regular air compressors by being adaptable to both home AC wall sockets and car DC sockets. Whether you need this compressor at home or on the road, you’ll be covered. Multiple Attachments – With its additional attachment nozzles, you would be hard-pressed to find something that this compressor cannot inflate, from heavy-duty car tires to a delicate beach ball. It is perfectly equipped to achieve the perfect pressure for any item. Advanced Functionality – The Kensun comes with a wide range of pressure measure 120 psi, the accuracy of measure: 35psi continuous working time 30 minutes at 35psi specifications Lpm (liter per minute) CFM (Cubic feet per minute) and GPM Gallons per minute.) These advanced functionalities provide you with the ability to accurately and efficiently inflate anything that you need to. Compact and Portable – A portable compressor should be easy to move around. At 3.45 pounds, this product is simple to carry. With dimensions of 11.8 x 4.3 x 6.7 inches, it can easily be stored in several places within your car. Fast Inflation Time – This product is impressive! In fact, it can inflate your tire to maximum capacity in six minutes or less. Reliability – The product comes with a two-year warranty that will offer you peace of mind. No Money Back Guarantee – Some customers have complained about the product smoking under use, and others have claimed that the AC function failed almost immediately. Unfortunately, these customers were reportedly not able to get their money back for the faulty equipment. 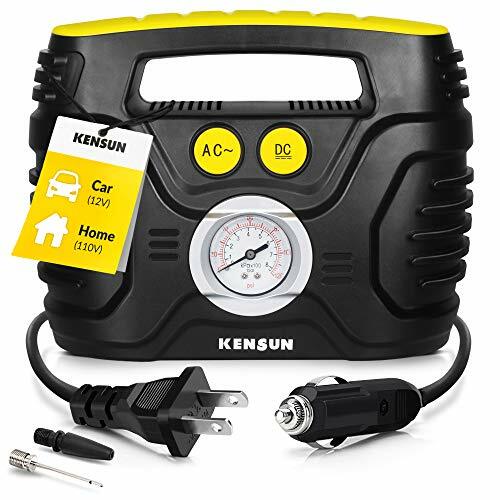 The Kensun AC/DC swift performance portable air compressor comes with an analog display that will be certain to deliver you the high-quality readings that you need when inflating your tires in an emergency. Low tire pressure won’t stand a chance against the high-quality performance of this product. Did you know that low tire pressure can decrease your gas mileage, wear away your tires more quickly, and sacrifice your traction and control over your vehicle? Without maintaining a quality tire pressure, you will find yourself suffering from potentially hazardous situations. Kensun is dedicated to manufacturing high-quality HID products so that customers can drive with full confidence in their automotive parts and accessories. Kensun has its finger on the pulse of the automotive community, listening to customer comments and building on experience to constantly improve and produce top-quality items. We see this dedication as more than just “good practice” but rather an ethos, part of a great mission. Q: Does it auto shut off when the desired pressure is reached? A: No, you cannot preset a psi. Q: How long is the extension cord to reach a wall plug? A: The Kensun comes with a 14-foot extension cord to get the AC unit powered. The cord works efficiently and effectively. Q: Does the unit have a battery built inside so that you can connect it without a power supply? A: No, the Kensun does not come with any sort of rechargeable features such as a battery pack. You will need to connect the product to either an AC or DC power supply to ensure that the product can turn on. If you are tired of feeling like you are left hanging on the side of the highway waiting for your AAA coverage to rescue you or if you have had enough with trying to replace your faulty tire with a donut in the rain, then the Kensun AC/DC swift performance portable air compressor is the product for you. 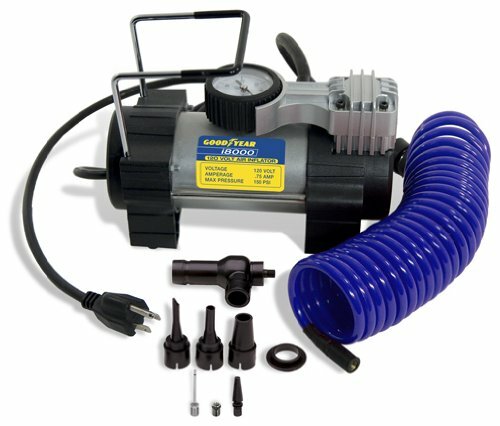 It is a terrific air compressor for inflating car, truck, and bike tires, and some customers have claimed that it takes less than one minute to effectively fill up their tires. Plus, the product will arrive nicely packaged and on time. Some customers have claimed that it takes less than one minute to effectively fill up their tires. The product is very compact and lightweight, great for leaving in the trunk with your spare tire kit or taking on a camping trip. It is very accurate and stable when adding air. While it doesn’t automatically shut off, it is designed to be fast, efficient, and safe and easy to use. You will be amazed at how quick and easy the product is to use. Keep moving forward with this Kensun product. 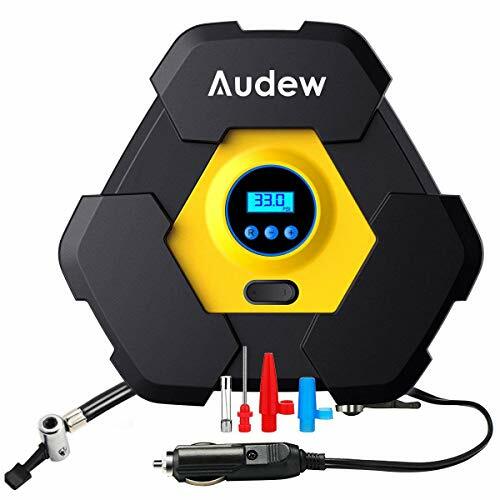 If you’re looking for an air compressor that will inflate your tires quickly while occupying a very small footprint, this Audew portable is the obvious choice. Although it’s marketed as a tire inflator, the additional tips give you the freedom to fill air mattresses, pools and sports equipment so it’s a multipurpose unit. If you want a travel air compressor so you don’t end up let down with a flat, Audew delivers a very portable model at a price you’ll love. It weighs in at 2.6 pounds and measures up at 9” x 8” x 4”. You can inflate at 35 liters per minute and maximum pressure is 150psi. As well as inflating your tires, the Audew also serves as a pressure gauge. You can glance at your readings on the blue backlit screen even in dim conditions. You can happily run your compressor for 8 minutes at a time before it needs a rest. If you’re looking for a powerhouse that will chug away all day, this is not the grade of equipment for you. For convenience and confidence in the car, though, the Audew makes a sound investment. Plugging straight into your lighter socket, you can confidently use this neat little compressor anywhere you go. While it’s not the quickest inflator on the market, there’s always some degree of compromise with a smaller unit. The LED flashlight is a valuable touch when you’re trying to inflate your tires in gloomy conditions. This highly portable air compressor from EPAuto is a dependable and versatile piece of kit to give you added peace of mind on the road. Although it’s not the briskest inflator, you can relax as the compressor does the work and wait for it to power down when the desired pressure is reached. While you won’t get any quick-release connectors, attaching and detaching is super-simple so this isn’t a deal-breaker. As a smaller unit, this works best on smaller vehicles and you will need to keep the engine running while it’s in use. Looking for a compact compressor that doesn’t stiff you in terms of performance? Goodyear won’t let you down. This compressor generates very little noise and it’s ultra-compact so you can pop it in the trunk without eating up too much space. Goodyear is an automotive titan, and this dinky compressor is absolutely ideal to prevent being caught short with a flat. Many small inflators seem to take an eternity to get air into your tires but the Goodyear will see you ready to roll in just 3 minutes. Although you’re rewarded with impressive power, Goodyear’s pioneering WhisperSoft technology means you won’t disturb anyone while your compressor is on the go. You should bear in mind that, like with all small compressors, you shouldn’t expect to run this appliance for hours on end inflating huge tires. As an emergency inflator for use on the road, though, it takes some beating. You’ll also be able to check your tire pressure but it pays to double check for accuracy against an established gauge so you can see what tolerance to work to.